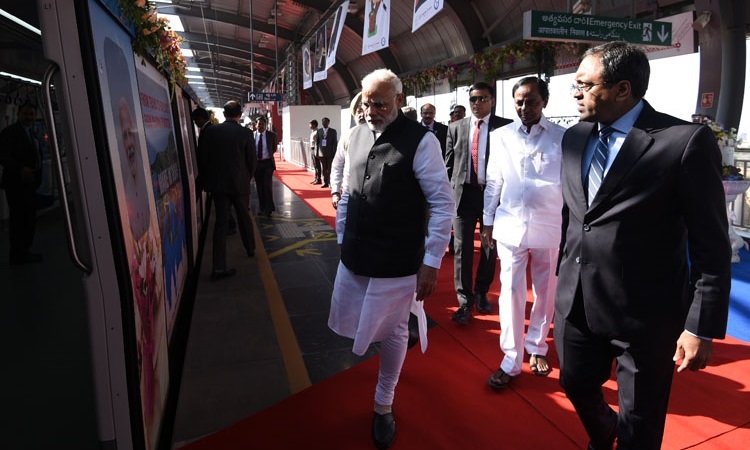 Prime Minister Narendra Modi inaugurated the first phase of the metro service in Hyderabad, Telangana on 28th November 2017. It boasts of a 30-km longest ever single metro track and will have 24 stations. The city's entire metro project of 72 kms is estimated to be completed in another year's time. It has also made Hyderabad the city with the longest metro constructed under a Public Private Partnership or PPP model. The inaugural saw a film being played about the Hyderabad metro's features and the journey of its construction. Prime Minister also launched metro app Savaari on the occasion. 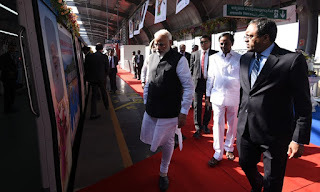 The inaugural also saw the Prime Minister ride the metro from Miyapur Station to Kukutpalli. Telangana Governor E L Narasimhan and Chief Minister K Chandrashekhar Rao accompanied the him on the 5 km journey. During the ride, the Prime Minister held discussions about the metro and its expansion.